It seems as though it just happened yesterday. But time has just flown by. 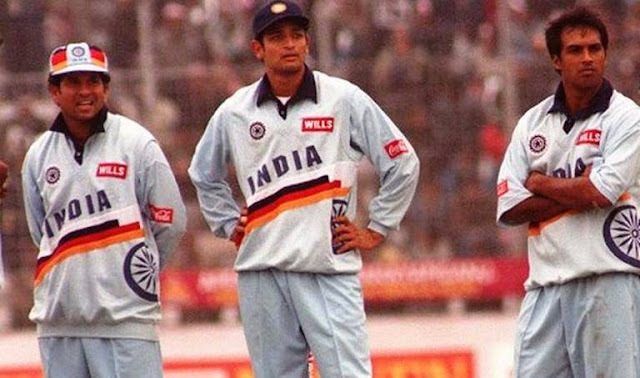 19 years ago ( Jan 1998), India was up against Pakistan in the finals of the Independence cup at Dhaka. Pakistan batted first and scored a mammoth total of 314 runs aided by centuries from Saeed Anwar and Ijaz Ahmed. Chasing huge scores like 300 were almost next to impossible during those days. In reply, Sachin and Ganguly gave a brilliant start scoring 41 and 124 respectively. Robin Singh scored 82 and India were cruising at 250/1; Robin Singh got out in the 38th over and wickets started tumbling and soon the score became 306/7 in the 47th over. Requiring 9 runs from 6 balls, Srinath the senior batsman had a newcomer Kanitkar as his partner. Srinath was known for his big swing and massive hits to the fence and he was more often sent up the order as a pinch hitter. So if he had faced the bowler, India had a huge chance to win. But with just 2 balls remaining, India needed 3 runs to win. Kanitkar was on strike and we almost lost hopes. The best spinner in the world at that time (Saqlain) was bowling. It was a perfect David vs Goliath moment. The unthinkable happened. Kanitkar blasted the ball to the fence. A new star was born. Watch the last ball four here. Its was a wonderful cricket match dear, thanks for share. Remember this match like yesterday... Time flies.